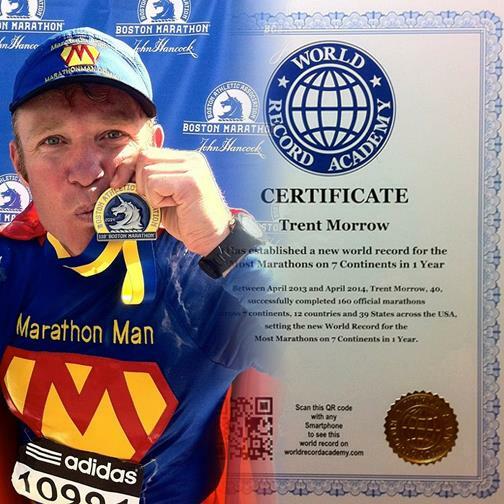 In 2013-2014 Trent Morrow was successful in running the most number of official marathons across all 7 continents in 1 year running a remarkable 160 marathons across 7 continents in 365 days to be the first person in the world to achieve such a milestone. The Marathon Man has achieved his vision to complete 160+ official marathons in the calendar year ending 31 December 2013 running a World First of 161 official marathons across 5 continents, 11 country and 34 US States. Along the way he has helped to raise awareness and support for key corporate & charity partners. The World Record breaking adventure of a lifetime ended on 21 April 2014 at the Boston Marathon, where Marathon Man completed his 200th marathon since 1 January 2013. In the 12 months period from 22 April 2013 to 21 April 2014 Marathon Man successfully completed 160 marathons across all 7 continents, a feat that has never before been attempted. Continents: Africa, Antarctica, Asia, Australia, Europe, North America & South America.